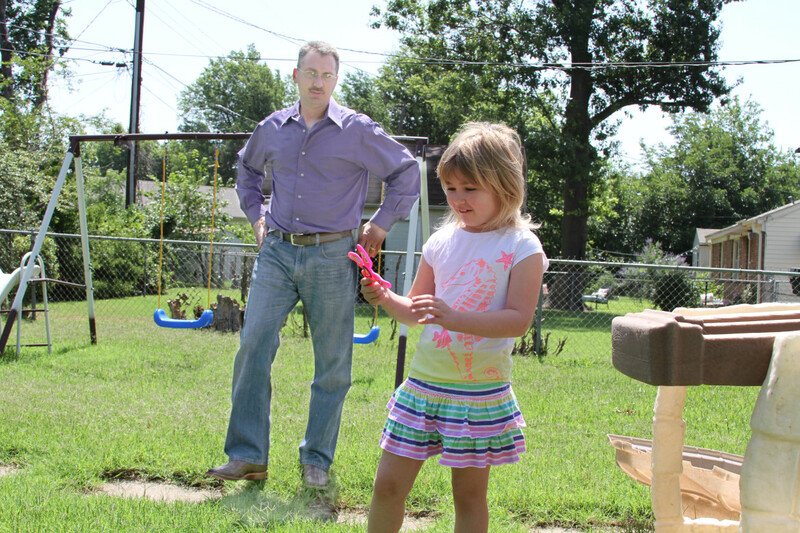 Michael Lockhoff plays with his daughter in their backyard in Tulsa. The Lockhoffs struggled last year, when she was 6, to work with schools to meet their child's educational and emotional needs. In Jenks Public Schools, campus police physically restrained and handcuffed a second-grade special education student. His crime? He ran to the playground to escape a noisy classroom. At Tulsa Public Schools, officials called a father and told him to pick up his 6-year-old daughter, who was having an emotional meltdown. He arrived to find four armed campus police officers holding her down, saying she assaulted one of them. In the Deer Creek School District in Edmond, a member of the school staff slapped an autistic child on two occasions, but a judge tossed out the federal lawsuit, saying the employees acted out of frustration. 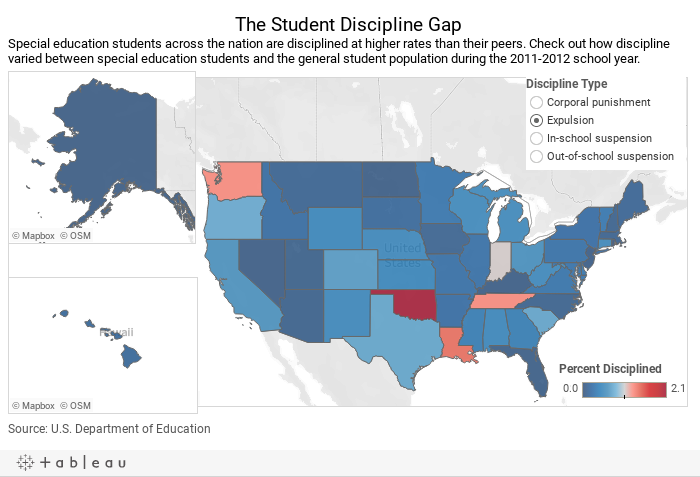 Across the state, students with physical and mental disabilities are bearing much of the brunt of classroom discipline, government data show. They’re more likely than their peers to be suspended, expelled, arrested, handcuffed or paddled. In dozens of schools, special education students are anywhere from two to 10 times more likely to be disciplined, the data show. At some schools, every special education student has been physically disciplined, suspended or expelled. The discipline trend has angered and frustrated some Oklahoma parents and triggered calls for reform from groups that advocate for special-needs children. They say excessive discipline is hurting students academically and psychologically. Teachers and administrators need better training on how to educate students with emotional and learning disabilities, not simply punish them or drive them out of the school, advocates say. Some school officials acknowledge there is a problem with disproportionate discipline. Others say that while schools must teach and manage children with disabilities skillfully, they cannot let a few students disrupt the classroom and hurt learning for all students. In an effort to address concerns, the U.S. Department of Education began requiring schools several years ago to track and report information about their disciplinary actions. Last year, the agency released disciplinary data for the 2011-2012 school year. An Oklahoma Watch review of that data found that Oklahoma ranked first in the nation in rates of special education students being expelled from schools. It ranked fourth in corporal punishment of such students, 19th in in-school suspensions, 28th in out-of-school suspensions and 20th in arrests. Some of these reflect Oklahoma’s general higher rates of discipline. But in each category, the share of special education students who were disciplined was higher than that of the other students, data show. The percentages statewide aren’t high, but they represent hundreds or thousands of students. For example, 2.1 percent of special education students in Oklahoma were expelled in 2011-2012, compared with 0.8 percent of other students. The 2.1 percent represents 2,099 children. In dozens of schools, the proportions of disciplined special-needs students run anywhere from 40 percent to 100 percent, compared with less than 20 percent for other students. Some districts stand out. Of the 20 schools with the highest explusion rates in the state, 17 are in Tulsa Public Schools. Each of those schools expelled more than 50 percent of its special education students. Special education students include those with learning disabilities, autism, development delays and speech and health impairments. Kelly Freeman at home with her 7-year-old son while he assembles a puzzle. The Freemans say their son still feels traumatized after being handcuffed at a Jenks school last school year. Kelly Freeman said her 7-year-old son is still traumatized after being left in handcuffs for more than an hour by campus police at East Elementary School in Jenks early last school year. Her son has attention deficit hyperactivity disorder, is treated for anxiety, and has hearing sensitivity. Oklahoma Watch is not publishing the boy’s name because of his age. Freeman said her son ran to the playground to get out of a painfully noisy classroom when a substitute teacher was there. With most of the teachers and administrators out for professional development, the school called campus police to get him. The officer physically restrained the boy on the playground, which caused him to panic, she said. The officer eventually handcuffed him with zip ties. The officer told Freeman he wanted to handcuff him because he was afraid he would jump out of the squad car since he was still trying to run away. The incident left the boy fearful of police. The school also continued to call campus police during the following weeks as the boy continued to run out of the classroom, Freeman said. The 7-year-old was also given out-of-school suspension for three days after he allegedly kicked one of the officers while trying to get away. Freeman said her son missed about another week because he was not allowed to return while the district made changes to a plan to address her son’s behavior. Her son will attend a private school this year. Jenks officials declined to comment on the case, citing student-privacy concerns. The Freemans declined to sign a waiver allowing the district to comment, saying they were concerned his entire school record would be released. Oklahoma had 100,683 special education students in the 2011-2012 school year, and they made up more than 15 percent of the state’s total student population, according to U.S. Department of Education data. The national average was nearly 14 percent. A child becomes a special education student after parents or school officials recognize a problem and arrange for the child to be evaluated by educators and disability experts. The student is then placed on an individualized education plan, which maps out how the school will address the child’s educational and behavioral needs. Most students attend regular classes but are given customized aid often through a certified special education teacher. Educators say training is needed for all teachers and administrators to improve learning and behavior for special education students. The higher discipline rates at many schools suggest a breakdown in that system. Oklahoma’s ranking in percentage expelled. Oklahoma’s ranking in percentage given corporal punishment. Source: U.S. Department of Education data collected from schools. However, Konawa Superintendent Andy Gower, who was not with the district in 2011-2012, said the high school principal at the time reported incorrect figures to the U.S. Department of Education. He said about 10 percent of both special education students and other students received corporal punishment. In Tulsa Public Schools, the state’s second-largest district, Hawthorne Elementary School expelled 57 percent of its special education population, or 27 students. By comparison, 84 students, or 16 percent, of other students were expelled. Memorial High School expelled 182, or 81 percent, of its special-needs students, compared with 434, or 48 percent, of other students. Make a phone call to Memorial High and among the first menu options you hear are about discipline: how to reach the dean of discipline and the assistant principal of discipline. The assistant principal declined to comment. At Eisenhower Middle School in Lawton Public Schools, 63 special education students, or nearly 40 percent, were given in-school suspension in 2011-2012. That’s the 97th highest rate of the 1,774 Oklahoma schools tracked. The rate was 26 percent for other Eisenhower students, or a total of 210. High in-school suspension rates for special education students were also seen at Tomlinson Middle School, Washington Elementary School and MacArthur High School in Lawton. Lawton Superintendent Tom Deighan said the district’s own data show higher discipline rates than the federal data do. Deighan did not know if that’s because the district’s data counted some children twice. About 18 percent of Lawton’s students are in special education. Michael Lockhoff said picking up his daughter early became a daily routine at Tulsa Public Schools. His 6-year-old daughter had emotional meltdowns that resulted in her having tantrums and wreaking havoc, such as flipping desks. A cause for her behavior has not been determined. Although the public school episodes were bad enough, the girl’s former school, a private school, threatened to expel her from kindergarten if problems continued, Lockhoff said. The family preemptively transferred her to Lanier Elementary School in Tulsa. After several months at Lanier, she was transferred to Project Accept, an alternative school. She started first grade at Salk Elementary School. before being home-schooled. The daily calls from schools to pick up his daughter eventually led Lockhoff to quit his job as an arborist so he could focus on her needs while his wife worked. He also said the district has failed to stick with her individualized education plan. After four police officers were called to restrain his daughter at Salk during one of her episodes, the Lockhoffs decided to home-school her. Lockhoff said he understands the difficult situation teachers face when dealing with his child at times, but said calling in four campus police officers went too far. One of those officers told the girl that she was assaulting a police officer. Lockhoff said despite her often being sent home early, his daughter has kept up with studies through home schooling. The family has re-enrolled her at Lanier for second grade, and said the school is providing an aide who will work only with their daughter during the day. Katherine Bishop, vice president of the Oklahoma Education Association, which represents teachers, said while stories like the Freemans’ or Lockhoffs’ are disturbing, most schools are doing a good job with special education students. “We are able to provide our students with mild disabilities and severe and profound disabilities with a solid education … Our schools are doing a great job,” said Bishop, a former special education teacher. She added that more resources are needed to hire special education teachers and provide them training. The federal government has not fully funded special education, an issue that is compounded by the state’s own budget woes, she said. The state Department of Education said it has provided training to address disparities in discipline, most recently with Oklahoma City Public Schools. “Certainly, the state Department of Education takes seriously allegations of excessive or improper discipline, and we investigate all such cases when they are brought to our attention,” said Rene Axtell, state assistant superintendent of special education. In Lawton, the district is seeing results from its focus on improving special education services, Deighan said. That includes providing training that helps teachers certified in another subject become certified in special education, and training on alternatives to discipline. Alternatives to discipline include practices meant to encourage better behavior or placing students in the district’s alternative school instead of suspending or expelling them. As a result, two of the three Lawton schools with the highest suspension rates – Eisenhower and Tomlinson middle schools – have seen fewer students disciplined in the past three years, Deighan said. Deighan expects suspension rates to continue to decline this school year. In Tulsa, the Freemans are preparing their son to start the fall semester. That has included trying to get him to rebuild his trust with police, and to find his love of school again. Freeman said her son’s personality changed after the handcuffing incident. Note: The story was updated Aug. 24 to include a response from the Konawa Public Schools superintendent.